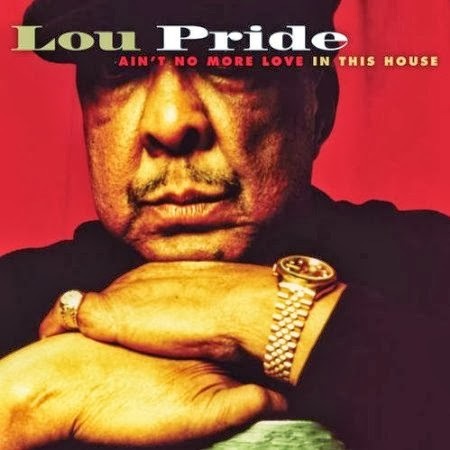 I just received the newest release (October 15, 2013), Aint No More Love In This House, from Lou Pride and it's solid soul. This,the final recording from Pride was just recorded prior to his death in June of 2012. Opening with the title track, Ain't No More Love In This House, Pride establishes that he he was a force to be reckoned with. This is a richly vocal backed track featuring Christal Rheams, Paige Martin and Daryl Duff and horns by Kenny Rittenhouse (trumpet and flugelhorn), Liesl Whitaker (trumpet and flugelhorn), Morgan Price (Sax) and Reginald Cyntje (trombone). On I Didn't Take Your Woman, Pride gets a solid groove going vocally and Benjie Porecki on keys along with the horn section provide a smokey backdrop for the lead work and crisp guitar work of Johnny Moeller. Steve Gomes lays down a very cool bass line keeping this track rolling tight. Speaking the intro to Take It Slow, Pride walks you into his smooth soul groove and envelopes you with the warmth of this track. Never is an easy tempo track which has been covered by several Reggae bands and the thread remains constant with the horn harmony. Pride adjusting back and forth from his natural singing voice to his falsetto voice is particularly successful on this track. Moeller opens the doors with hot guitar riffs on She Boom Boom Me, the track showing traces of JG Watson. Moeller is alive on this track really stiring up the flames and Rittenhouse and Whitaker riding high on the wave. Excellent! Love Come Got Me is a bopping cool soul track with Robb Stupka showing strong drum chops and Moeller and Porecki providing the basis for the track and Rittenhouse and Whitaker adding punctuation throughout. Solid vocal backing really gives pride free rein to guide the track. I Gotta Move On Up has a super sway and pride lays back on the track just riding the melody. He has an excellent feel for this style of music and it's a genuine pleasure to listen to him roll it out. Moeller takes a cool guitar solo on this track as well punching up the track. One of my favorite tracks on the release, Daddy Don't You Walk So Fast, has Pride in a somewhat spiritual posture singing lead over a smooth bed of keys and percussion. Adding his lead vocals over a cloud of backing vocals really works especially well on this track. Wrapping the release is Holding Back The Years, a faster soul track with a cool groove. This entire release has strong character and warmth which makes it an absolute pleasure to listen to. If you support live Blues acts, up and coming Blues talents and want to learn more about Blues news and Fathers of the Blues, Like ---Bman’s Blues Report--- Facebook Page! I’m looking for great talent and trying to grow the audience for your favorites band! - ”LIKE” This track is not from the new release but characteristic of Lou's work.